So you want to buy an iPad? Great. Would you believe Apple actually offers five different iPad models? Sure, the company only touts two of them — the iPad Air 2 and the iPad mini 3 — but Apple continues to carry three older models that could be right for you, depending on your circumstance. In this guide, we’ll take a look at the different iPads Apple offers to help you decide which model is best for you. Apple also offers the original iPad Air in its current lineup. When comparing the 16GB models (the iPad Air is available with 16GB or 32GB storage), you save $100 if you go with the iPad Air, but it lacks the Touch ID, iSight burst mode, and the anti-glare screen that is found in the iPad Air 2. It’s also a little thicker and uses an older and slower 64-bit A7 processor with an M7 motion coprocessor. The iPad Air 2 is worth the extra money, even if only for the laminated anti-reflective display that makes content look absolutely gorgeous. For a deeper dive into the differences between the iPad Air 2 and the iPad Air, read the MacRumors iPad Air 2 roundup. 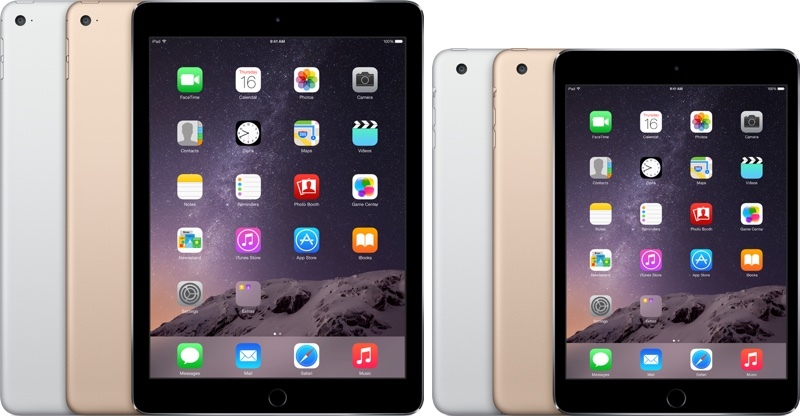 Apple has two other iPad mini models in its current lineup, and both are older models. The iPad mini 2 has only one major feature difference from the iPad mini 3: Touch ID. While Touch ID is a great security feature that’s convenient to use, you might be willing to sacrifice it to save some money. Also, the iPad mini 2 is the only iPad mini model available with 32GB of storage, a nice alternative for anyone who doesn’t have the cash for a 64GB iPad mini 3. The original iPad mini does not have a Retina display; its resolution is 1024‑by‑768 resolution at 163 pixels per inch. It has an older and slower A5 processor, and has no support for panoramic photos, camera burst mode, or video zoom. It’s also available only with 16GB of storage. It’s the entry-level, cheap iPad in Apple’s lineup, good for Internet access, ebooks, and casual games. 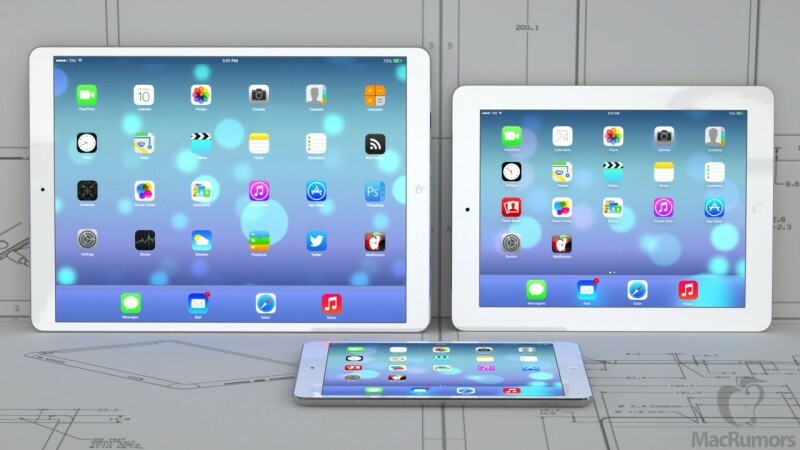 The MacRumors iPad mini 3 roundup has more details on the differences between the three iPad mini models. If you want to get the fastest, most current iPad available, pick the iPad Air 2 — it’s a remarkable 87 percent faster than the iPad mini 3 in Geekbench 3 multi-core benchmark, and it’s an impressive 34 percent faster in Geekbench’s single-core benchmark. The iPad Air 2 is Apple’s fastest iPad to date. Thinking about buying an iPad Air instead, to save a few dollars? You’ll make a performance sacrifice. The iPad Air 2 is 70 percent faster in Geekbench’s multi-core benchmark, and 23 percent faster in Geekbench’s single-core benchmark. When it comes to the iPad mini 3 and the iPad mini 2, there’s virtually no performance difference because they use the same internals. Geekbench results show that the iPad mini 2 is marginally faster than the iPad mini 3, but we’re talking low single-digit percentage points. There’s no need to consider performance when deciding between the iPad mini 3 and the iPad mini 2. There’s a huge difference between the iPad mini 3 (and iPad mini 2) and the original iPad mini. You’re going to give up a lot of performance to save some money. 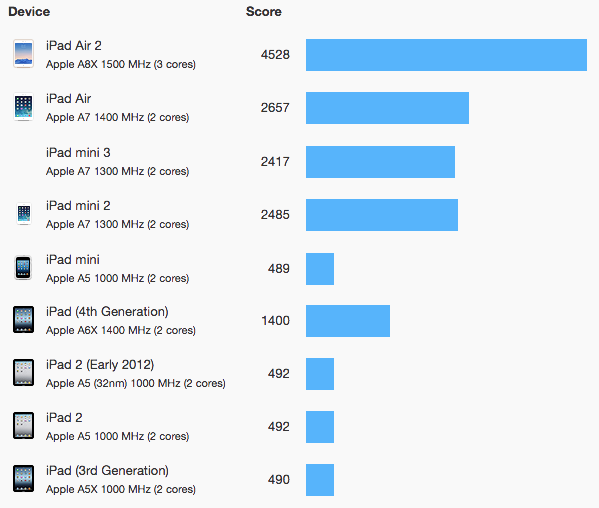 In Geekbench’s multi-core benchmark, the iPad mini 3 is nearly four times faster than the iPad mini. 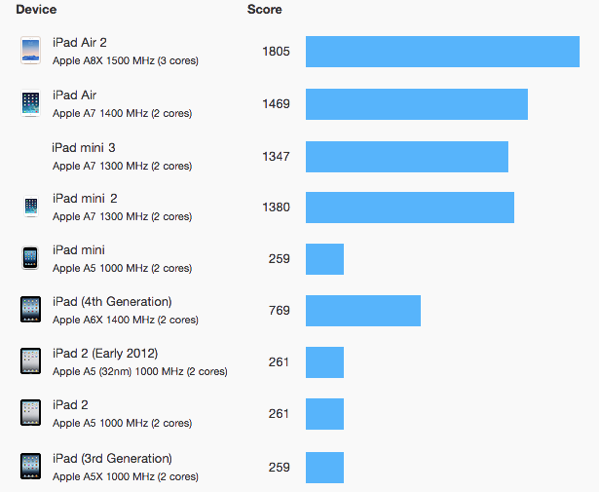 In Geekbench’s single-core performance, the iPad mini 3 is well over four times faster than the iPad mini. So is it worth saving $150 to buy a $249 iPad mini over a $399 iPad mini 3? For anyone on a budget, it’s a compromise that has to be made, but you might want to consider buying a $299 16GB iPad mini 2 instead. For the extra $50, you get the same performance boost as you would if you bought an iPad mini 3, and the only feature you miss out on is Touch ID. Apple offers several features that you can add to the iPad. They all cost extra, so be prepared to add to the price of the standard configuration model. Storage: All iPads start with 16GB of storage. The latest iPad models have options to upgrade to 64GB (an extra $100 to the base price) or 128GB (an extra $200 over base) — there’s no 32GB option anymore. If you play a lot of games with detailed graphics or like watching movies and TV shows, consider getting more storage. Otherwise, you’ll find yourself trying to remove storage-hungry apps, removing media files more often than you’d like, and relying on cloud storage (which could be fine if you’re always connected to the Internet). Cellular connectivity: Speaking of Internet connectivity, if you need to be online most of the time with your iPad, you can’t always depend on a Wi-Fi connection being available. Apple offers cellular iPads that work with AT&T, Sprint, T-Mobile, and Verizon in the U.S. and a variety of carriers internationally. Cellular support adds $130 to the price of all corresponding models, plus you have to sign up for a data plan with each carrier and pay a recurring fee. If you already have a plan, see if it has an option to add an iPad data plan. If you have an iPhone on a service plan that allows mobile hotspots, also consider whether pairing a Wi-Fi iPad with an iPhone will meet your needs. With Instant Hotspot in iOS 8, it’s dead simple to allow an iPad to connect via Wi-Fi to an iPhone and use the phone’s cellular data service as needed. Available finishes: The iPad Air 2 and the iPad mini 3 are available in gold with a white bezel, silver with a white bezel, and space gray with a black bezel. The iPad Air, iPad mini 2 and iPad mini are available in silver/white and space gray/black. There’s no extra cost for picking the colors of your choice. AppleCare+: Each new iPad comes with one-year warranty and 90 days of complimentary support. For an extra $99, you can get AppleCare+, which extends the warranty and support to two years and also allows for two incidents of accidental damage coverage (subject to a $49 service fee per incident). AppleCare+ is a good idea if your new iPad is going to be used by several people, such as by your family or in a classroom. And if you plan to bring your iPad with you while traveling or working on location, the accidental damage coverage is reassuring. Fortunately, you don’t have to buy AppleCare+ right away. Apple gives you 60 days from the date of purchase to buy AppleCare+. You can buy your new iPad, monitor how it’s being used, and then decide to invest in AppleCare+ if it fits your use case. As you may or may not know, there are hundreds of different kinds of accessories you can buy with your iPad. 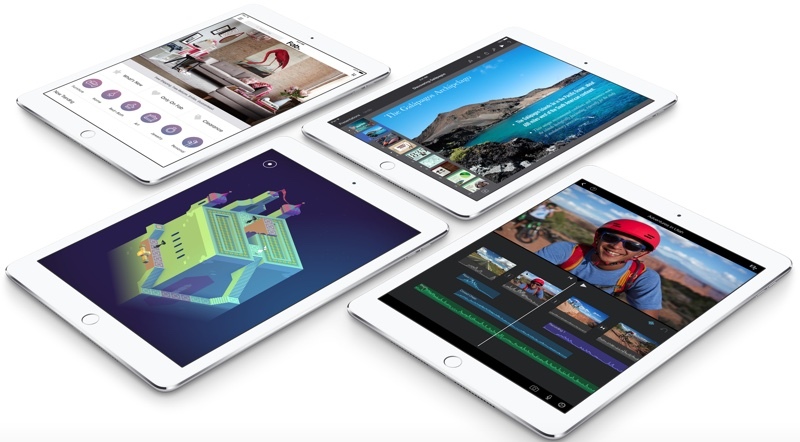 These are just a few you might consider when you’re buying your new iPad. Cases: A case will help protect your investment. Cases are as simple as a protective sleeve, or as complex as a combination case/stand/keyboard. Expect to spend $25 to $150. Apple’s $39 iPad Air and iPad mini Smart Covers use magnets to attach to the iPad and the protective flap folds to do duty as a stand. 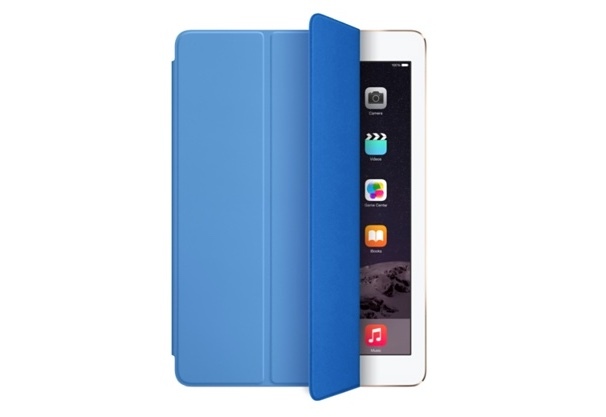 A more expensive Smart Case ($69 iPad mini, $79 iPad Air) offers better protection and features the same folding cover. Cables: The iPad comes with a USB to Lightning cable, but you might want to buy an extra one. They’re a little pricey; a 1-meter cable is $19. Cheaper non-Apple Lightning cables are available, but shop carefully, since many cheap cables are not durable, or the may not work properly with your iPad. Input devices: Since all iPads have Bluetooth, you can use a Bluetooth keyboard ($50 to $170), which is ideal if you want to do a lit of writing. Some keyboards that are designed for the iPad have a built-in iPad stand or an do double duty as a case. If you’re an illustrator, you may want to buy a stylus ($15 to $100), especially one that’s pressure sensitive. It’s easy to recommend the iPad Air 2. It’s fast and lightweight, and the new anti-reflective screen is a vast improvement. It also has features not on the iPad Air, most notably slow-motion video capture, burst camera mode, and Touch ID. The iPad Air seems like an affordable alternative, but the iPad Air 2’s price/performance and features are an excellent package well worth the money. 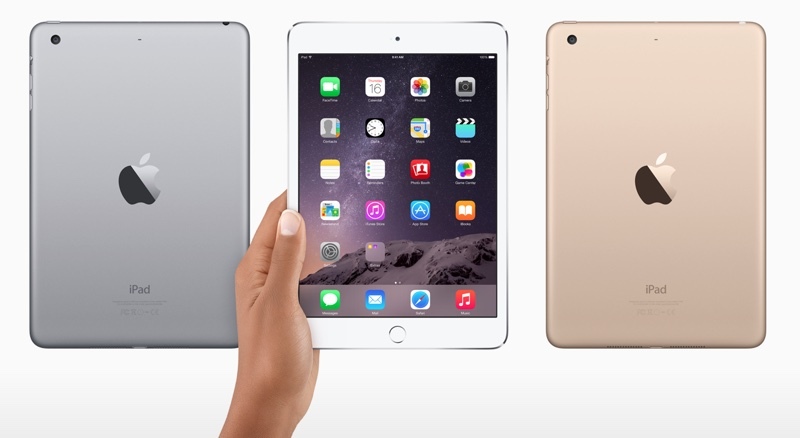 If you prefer a smaller iPad, you can choose between the iPad mini 3 and the iPad mini 2. The only difference between the two is Touch ID — is a fingerprint sensor really worth the extra money? Touch ID is a convenient feature, but it’s one you can probably live without. Save some money and go with an iPad mini 2. However, if you want 64GB or 128GB of storage, your only choice is the iPad mini 3 unless you can still find one of the higher-capacity iPad mini 2 models on closeout somewhere. The original iPad mini is Apple’s entry-level device at $249 and could be a good iPad dedicated to your kids. Should you get an iPad mini 3 or 2 if you have an iPhone 6 Plus? The iPhone 6 Plus has a nice, big screen, but the iPad mini’s screen still offers quite a bit more screen real estate. More importantly, the iPad mini will use the iPad version of your apps, while iPhone versions run on the iPhone 6 Plus. iPad apps are designed to take advantage of the bigger screens, so the interfaces are different than iPhone versions, which have interfaces made for smaller screens. If you’re not in a rush to buy a new iPad, you could wait and see if/when Apple releases a 12-inch iPad Pro. Rumor says that the iPad Pro will measure between 12.2 and 12.9 inches, resemble the iPad Air 2 and iPad mini 3, and use the same A8X processor. Finally, if you want to save a few dollars, check Apple’s refurbished store. Apple installs a new battery and replaces the outer shell on refurbished iPads, and you get the same one-year warranty as you would with a new iPad. The inventory varies greatly, so make sure to check back frequently if the model you want isn’t in stock. It also takes a few months for new products to begin showing up at all in the refurbished store, and at the time of this writing, Apple had yet to begin offering refurbished versions of the iPad Air 2 or iPad mini 3. Since a lot of returns happen after the holidays, there may be and influx of new products in the refurbished store soon.